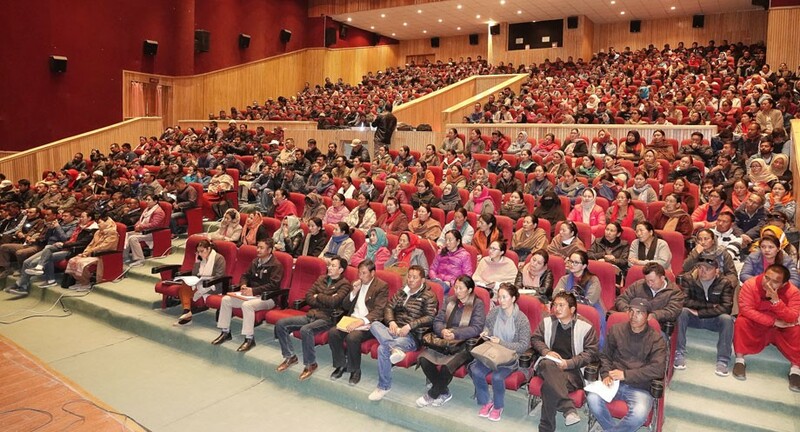 The first training for polling personnel including the Presiding and Polling officers for the upcoming Lok Sabha elections was held under the supervision of Avny Lavasa, DC/ District Election Officer on April 3 in Leh. A total of 250 male and 298 female Govt. employees of Leh, Nyoma, Durbuk and Kharu Tehsils attended the training programme. Avny Lavasa informed that around 90 crore citizens are going to cast their votes from 725 districts for 545 parliamentary constituencies at around 1 Lakh polling stations in the forthcoming Lok Sabha Election. She said that self-conduct of each polling staff is very important in completing the entire election process of the country. She strongly stressed upon the responsibility of every individual to uphold the credibility of election constituency of India with due respect to the Indian election process known across the world for its transparency. All the government employees were instructed to take the training seriously saying that even a small mistake of an individual can spoil the entire election process of the constituency. Avny Lavasa informed that this time the Election Commission of India has instructed to have women polling stations. She added that it’s a proud moment for Leh district to have all women polling station while other districts are facing difficulties in having a single women polling station. She expressed that here the women employees are much capable and confident of their election roles and responsibilities and assured full support to facilitate them through the entire series till the day of the election. She urged all the polling staff to approach her office to seek any kind of help in improving or easing their duty. Dr. Stanzin Rabgais and Dr. Tundup Namgail, Nodal Officers for Manpower and Training gave training through presentation and meticulously highlighted the role and duties of Presiding and Polling Officers. A detailed training and live demonstration on the functioning and working procedures of EVM-VVPAT machines was also given to the employees by the Nodal Officers EVM-VVPAT, Thinless Dawa and Mohd. Ayub. Similarly, a 2-day training for the Govt. employees of Khaltsi and Nubra sub-division under the supervision of respective SDM.